Regardless of the type of tenancy you are interested in, before any tenancy begins an agreement must be reached with the property owner as to the rights and responsibilities of each party involved. This agreement may simply be an oral agreement, or it may be formalised and written down. The resulting document may be called any number of things including a lease, a rental agreement, a letting agreement or a tenancy agreement. Though written tenancy agreements are not required by law for all types of tenancies in the UK, it is good practice for everyone involved to have identical, written and signed tenancy agreements for whatever letting/tenancy terms are agreed. After being signed or orally agreed, a tenancy agreement can usually only be changed if both the landlord and tenant agree to the changes. If this is the case, then a new tenancy agreement should be written and signed to reflect the changes, or a written amendment should be drawn up and signed for the same purpose. 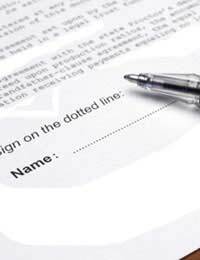 Oral agreements can also be amended, though without documentation it may be harder to prove. Witnesses who heard the new terms agreed, or a precedent by which the new terms are accepted (for example, by the rent being collected on a new day each week/month) can act as evidence of a new agreement if needed. Understanding a tenancy agreement can be difficult if you are new to tenancies and unfamiliar with common terms involved. If you have any questions regarding your tenancy agreement, do not hesitate to ask for clarification before making an agreement or signing documents. A Citizens Advice Bureau (CAB) or private solicitor should be more than able to advise you on tenancy agreements, and most estate agents should also be able to clarify common terms. If you are unhappy with the terms expressed in a tenancy agreement, then discuss them with those involved or consider looking for a new tenancy rather than remaining uncomfortable with the terms of your living arrangement.